Perfect location on Lönnrotinkatu in the center, within walking distance from everything the center has to offer. The apartment has two bedrooms with 5 sleeping places. We have one sofa bed in the livingoom. Also baby crib in one of the bedrooms. Separate kitchen and dining area. Bathroom with washing machine. Perfect for a family vacation or work trip to Helsinki. 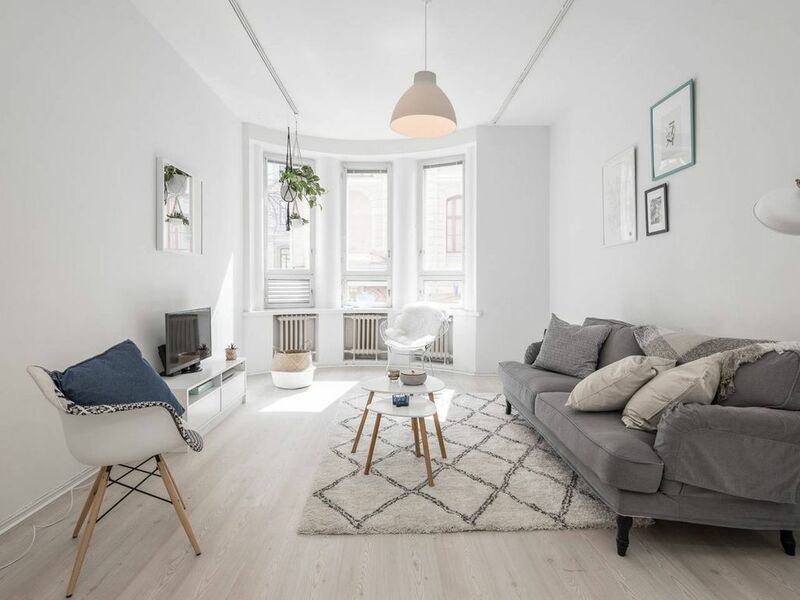 This apartment is 100sqm and located in the center of Helsinki (Kamppi/Hietalahti). 2 bedrooms with total 5 sleeping places. Sofa and baby crib available. Suitable max for 6 persons. One bathroom with shower and toilet. Washing machine. Wireless 4G internet connection, hairdryer and an iron are available. We will provide you with clean sheets and towels. Centrally located and just minutes walk to the Kamppi and Stockmann shopping centers, central bus/railway station and subway. Lots of pedestrian areas with shops, restaurants and cafes are right outside the apartment. Access to the marina and waterfront area. Popular Hietalahti Market Hall and flea market just next to the corner. Location can not turn any better! Tram 9 and 6 wll take you to center in a few minutes. Otherwise walking is highly recommended as the distances are really short in the central area. The nearest metro station is in Kamppi. If you are interested in visiting in Tallinn, the harbour is only 15 minutes walk away from the apartment. Spacious two bedroom apartment with well equipped kitchen. Beds were very comfortable. A warm flat. We were a family of 5. 4 adults & a 6 month old baby, the apartment was located about a 25 min walk from the train station, but is very convenient for walking into the centre of Helsinki takes about 15 minutes. We found the apartment easily, if we had any problems Matilda was always accessible.The apartment itself was spacious two good size bedrooms & a cot for the baby,the living room was a decent size with Netflix for your entertainment. The kitchen was well equipped plus a big table we could all eat at.The bathroom was like a wet room with a good shower. Also the apartment was nice and warm.The one thing to say it was up two flights of stairs on the first floor with no lift just in case anyone struggles with stairs. In general, it was a good apartment for us. Comfortable for 5 of us (2 adults and 3 children). Some things to be aware of before you book. You will need to bring your own paper towels, soap, and toilet paper. There are no extra pillows or blankets which might be problematic in the winter. No instructions on the apartment are included, so you will need to figure out the washer and television on your own. Anastasia is easy to communicate with for your booking. Lovely, clean, bright apartment & much bigger than we expected. The apartment is 10 minutes walk from the main centre, we would recommend it as a great base for exploring Helsinki. Despite it being on a main road, the double glazing keeps any road noise out. The apartment is clean, tidy and welcoming, especially the half bottle of gin left by previous visitors (thanks!). There is a great Thai restaurant a few steps away, the supermarket very close by too. Highly recommended! This apartment is convenient to grocery shopping, a food hall, and public transportation. It is comfortable for 4 adults and one child. The beds as listed are misleading. There is one king bed and a crib in bedroom 1 and one king and one single in bedroom two. The sofa is not a sleeper. The kitchen is lacking in essentials for cooking. There were no spices with exception of salt. A small roll of paper towels which ran out the first day and no napkins or kitchen towels. The oddest thing for us was the washer. The water runs into a drain in the bathroom floor leaving the floor constantly wet with laundry machine usage and showers. Communication with Anastasia was great and the apartment was bright and airy. We had a lovely visit to Helsinki and can't wait to return! The apartment is lovely and bright and very well equipped. Beds are really comfortable. You are close to the centre of everything and can walk to all the main sights and areas. Check in was easy and Matilda was really helpful and informative. Great location. Easy walking to main cbd. Beds comfortable. Close to nice restaurants. Easy access to apartment on arrival with owner representative waiting for us.